Staatsarchiv Hamburg. Hardcover. 3923356714 Good Condition. Five star seller - Buy with confidence! . Good. Staatsarchiv Hamburg, 1995. Hardcover. Good. Hamburg: Staatsarchiv Hamburg; Schmidt, 1995. Book. Near Fine (Book Condition). Hardcover. Over 11 Inches. [Our rating system: 1.Fine; 2. Near fine; 3. Very good; 4. Good; 5. Fair.]. Staatsarchiv, Hamburg, 1995. First Edition. Hardcover (Original Cloth). Very Good Condition/No Dust Jacket. Previous owner's bookplate on the inside of the front cover, text of the book is in German, but the people listed in the book are in alphabetical order, and the brief epithet would seldom require translation e.g. "deportiert nach Auschwitz " Size: 4to 9¾" - 12" tall. XXIV, 452 pages in original black cloth covered hardcover binding, no damage to report.. Text is in German. Please refer to accompanying picture (s). Quantity Available: 1. 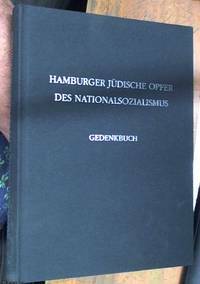 Category: Sociology & Culture; Judaica  Holocaust; Germany; WW II; German Language; genealogy & Local History. ISBN: 3923356714. ISBN/EAN: 9783923356713. Inventory No: 0264854. . 9783923356713 THIS BOOK WILL INCUR EXTRA POST OUTSIDE OF AUSTRALIA, BECAUSE IT IS OVER 1 Kg WITHOUT PACKAGING, PLEASE ENQUIRE BEFORE ORDERING. Staatsarchiv , Hamburg, 1995. First Edition. Hardcover. Very Good Condition. Previous owner's bookplate on the firts page, text of the book is in German, but the people listed in the book are in alphabetical order, and the brief epithet would seldom require translation e.g. "deportiert nach Auschwitz " Size: 4to 9¾" - 12" tall. XXIV, 452 pages in original black cloth covered hardcover binding, no damage to report.. Text is in German. Please refer to accompanying picture (s). Quantity Available: 1. Category: Politics & Government; Judaica  Holocaust; Germany; German Language; Military & Warfare. ISBN: 3923356714. ISBN/EAN: 9783923356713. Inventory No: 0264866. . 9783923356713 THIS BOOK WILL INCUR EXTRA POST OUTSIDE OF AUSTRALIA, BECAUSE IT IS OVER 1 Kg WITHOUT PACKAGING, PLEASE ENQUIRE BEFORE ORDERING.